A few weeks ago, the shortlist for the Wales Book of the Year Award was announced, alongside the public vote for the 'People's Choice Award'. 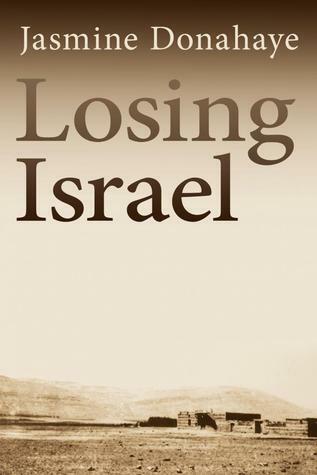 Among the shortlisted books, the title Losing Israel grabbed my attention (despite the rather bland cover image). I make no secret of the fact that I'm a member of the Palestine Solidarity Campaign, so naturally I take an interest when a book about Israel is in with a shot at a literary award in my own backyard. "During a phone call to her mother Jasmine Donahaye stumbled upon the collusion of her kibbutz family in the displacement of Palestinians in 1948 - and earlier, in the 1930s. She set out to learn the facts behind this revelation, and her discoveries challenged everything she thought she knew about the country and her family, transforming her understanding of Israel, and of herself. In a moving and honest account that spans travel writing, nature writing and memoir, Losing Israel explores the powerful attachments people have to place and to contested national stories. " It's a promising description, as it offers a personal perspective of a complex situation. When I started reading, however, I very quickly found myself far away from my usual reading habits. As you might expect from a reader primarily interested in science fiction and fantasy, I enjoy stories with a plot and some exciting premise that takes me away from the everyday world. I do read occasional literary fiction and, less frequently, non-fiction books, but they often require a change of mental gears. Losing Israel required a bigger gear shift than the other non-fiction books I've read: I found it very slow to begin with. The best nonfiction hooks you from the first page - like The Tale of the Dueling Neurosurgeons, and good travel writing usually lures you in with an intriguing, evocative start (e.g. the Wales Book of the Year Award winner Cloud Road, which then lost a lot of the momentum of the start of the narrative). Losing Israel, on the other hand, has a very slow, meandering beginning. The first quarter of the book is not very engrossing, which does not bode well for its chances at finding a large audience. Once I got used to the nonlinear, meandering literary rambles, the book did become interesting. It never really moves beyond the cover blurb in terms of events, so whether you find it absorbing will rely heavily on how interested you are in getting a glimpse of another person's life and views. I would recommend the book to other people who have never themselves been to Israel or the Palestinian territories, but who want to understand the issues that cause the conflict in that area, and to readers wishing to glimpse the conflict through the eyes of a liberal Jewish Israeli Expat. The book also stands out because it isn't biased and one-sided, unlike most things written about Israel and Palestine. Jasmine Donahaye interrogates the history of Israel through the microscopic perspective of her own family history, and then maps that onto the larger history. She goes out of her way to find truth and reality, and wrote as truthful a book as she could. However, it is very much a book about the past, with comparatively little interest in the present, and virtually no interest at all in the future. It's good background reading, but won't help anyone trying to imagine a different future for Israel or the Palestinians, and to me, that was a little disappointing. I'm not sure whether a Spoiler Warning is necessary for literary non-fiction, but I felt a desire to discuss aspects of the book in more detail, or rather, to argue with the text. I think as a reader, I would not have wanted to know more than the back cover already reveals about the book's events, so: SPOILER WARNING for the rest of this blog post / review. I would only recommend reading the rest if you've already read Losing Israel. One thing that struck me is that Jasmine Donahaye's ignorance of Israel's history was not wholly due to indoctrination and selective information. The blurb and the book present her realisation of a gap in her own narrative of Israel as an awakening, an accidental epiphany, triggered by a phone conversation with her mother. I'm sure that's true, but when you read the book, it also becomes clear that this revelation only really sank in because of the particular timing of that conversation. There is a fascinating article about advertising, of all things, which relates to this: "How Target Figured Out a Teen Girl Was Pregnant Before Her Father Did". The article explains how researchers have found that humans become creatures of habit, including their consumer behaviour. The habits become so strong that it's very, very hard for advertisers to effect any changes. However, during certain periods when we go through big life changes, humans suddenly become incredibly flexible. All their habits are suddenly fluid and up for grabs. Getting married, having children, getting divorced, leaving university, starting university, moving to a new city, getting or losing a job. It seems self-evident that all of these would involve some changes, but on a purely intuitive level, you might wonder why, say, your shampoo or toothpaste brand choices should become more flexible just because you happen to have graduated from university. Advertisers don't care about the reasons, what they care about is the opportunity, and in this case, one particular period of pattern fluidity turned out to be identifiable to a chain of shops based on the things people bought using the reward cards - and once identified, those shoppers were targeted with extra and personalised advertising to tap into this flexibility. "What I knew about the Nakba I knew in a broad, general sense. Even though I had learned a little bit about this other history, about people fleeing their homes in fear, I knew and didn’t know, just as many Jews, many Israelis, deliberately or otherwise, know and don’t know. The details of who and how and where are passed over or sidelined in the ongoing argument about why people left, about what created the Palestinian refugee ‘problem’. There are exceptions, like the massacre at Deir Yassin, although I had never heard of Deir Yassin as a child or a teenager. In many ways it is the argument over such extreme cases that has allowed the particular stories elsewhere to be lost in the broad generality of the term ‘Nakba’ or the ‘War of Independence’. When, earlier, I had learned in a general sense about Palestinian Arabs fleeing the threat of war and then fleeing war, about villages being destroyed to prevent their return, and to erase their memory, I had been outraged, and am still outraged. Nevertheless, there was always something detached about my reaction; it was always an outrage that had happened somewhere else. But here it was close to home, not in the abstract: here it was near Beit Hashita, in the place my mother came from. What had happened there? How had it happened – and how was it that I could not have known? All the many times I’d visited the kibbutz, all the long weeks and months I’d spent there, nobody had ever mentioned the villages. I’d never heard them spoken about, never heard the story told – and hearing nothing, knowing nothing, I’d never had a reason to ask. " ...and this is where I simply cannot agree with the author. To say she'd "never had a reason to ask" is not quite right. To know about a massacre and ethnic cleansing, and about outrageous deeds committed by one's country is a reason to either ask, or at least to not treat it as "abstract" and something "that had happened somewhere else". It seems to me that her ignorance prior to the period she describes in this memoir was not purely other people's fault: not to interrogate the past had simply been her routine, and when her sister died, that routine collapsed, became fluid, and she suddenly became open to a radically different view of her own family history. The book is a story of a woman trying to find herself, to gain an understanding of the history that shaped her, her mother, and the way her family shaped the history of a land she'd loved and worshipped. There's quite a lot of navel-gazing introspection, a heavy dose of Weltschmerz, a great dollop of uncertainty. On the one hand, I want to applaud the author for bothering. Her efforts to seek out Palestinians, Arabs and their views are commendable. Going through a reassessment of one's sense of belonging must have been traumatic. And I also want to applaud her braveness for daring to write about a topic that frequently results in bullying and hate campaigns against anyone who dares to say anything at all. However, having found her world view changed, it's disappointing that she does not seem interested in taking much action to affect the world in turn. The very existence of the book is clearly an achievement, and months of work must have gone into it, but I can't help wondering, is that it? Will she be sending a copy to the racist aunt whose deeply racist proclamations about Arabs and Africans she did not dare challenge at the time due to being a guest and bound by the rules of hospitality? Probably not. "What can I say to Myriam? I know that if I were to describe the hospitality I received from Abu Omar, from Randa and Ghaith, she would surely say, as she said about the man who changed my tyre the previous year, ‘Nu, so there are some good Arabs.’ It would not affect her feelings about the undifferentiated mass of ‘the Arabs’. What I am doing and where I have been travelling is a provocation to her – and it is therefore harder, and it costs more for her to offer me hospitality than for me to accept it. She welcomes me into her home despite what she herself is appalled by in me, despite what I am doing, which to her is treacherous and dangerous. She must be raw with aggravation, but she does not tell me to go and never come back – I am family. She welcomes me because hospitality is, to her, something unbreakable. Also, I realise, quite suddenly, quite unexpectedly, that she loves me. I watch her, sitting exhausted and shrunk in the huge chair, with her tired, angry face, and she looks up at me and gives me her ironic, lopsided smile and that ineffable Israeli shrug, and the breach, the gulf, is sealed up, and none of it matters, because I love her too." Having just searched for the name Myriam in my Kindle edition, about half the instances of the name ask "What can I say to Myriam", and in the end, the author never says anything. This, the end of a chapter and final appearance of Myriam, shows the exact thing I found so frustrating: an unwillingness to challenge the darkness, and an overly conciliatory attitude: that sense that Myriam must be even more appalled by Jasmine's actions than Jasmine is by Myriam's attitudes, so therefore, despite their differences, everything is somehow alright, and family ties and love matter more than right and wrong. This is simply not a perspective I can sympathise with. "It is a bad sign, I think, if I can begin to use the word Palestine without discomfort and uncertainty. None of the approximations or conjoined names that attempt to repudiate that future deliberate amnesia are satisfactory – 'Israel/Palestine' or 'Israel-Palestine', or their reverse. Better that the name Palestine remain bulbous and burgeoning with ambiguity; better that the landscape remain complex and difficult; better that I hesitate between naming this tiny iridescent bird an orange-tufted sunbird, or a Palestine sunbird." "My country Israel is leaving me too, but not 'into the hands and possession of another country and another civilization', as J.R. Jones saw the predicament of Wales, and as is the predicament of Palestine. My country is leaving me because its story is ceasing to exist, and because of what it has strangled out of existence. I grieve the loss, I grieve its departure from me, but it’s a grief coloured darkly by shame." "Love of a person, of a place – the more you know, the more complicated it is. The knowledge that the person is wounded, that the place is stained doesn't diminish your love. The person and the place matter less, perhaps, than your need to love,"
These three passages struck an unhappy chord for me. I am glad the author expended the energy to look into Israel's history, and her own family history. I am very glad that her certainty in the Goodness of Israel has been shaken, that she has grown sympathetic to the Palestinians' perspective. But the world does not need her to feel "discomfort" about terminology. The world does not need her to grieve for an Israel that never really was real, or to wallow in shame. Neither does it matter whether she feels a need to love the place, tainted though it may be. The world needs people to care, to talk, to speak out. It needs people who can see different sides (as the author does) and who can advocate for empathy and justice and decency. I was initially quite excited about the book, hoping that it might be a useful one to recommend to people as a nuanced, truthful and worthwhile introduction to the Israel / Palestine issues. And the book is nuanced, truthful and worthwhile about the events of 1948. So it's a shame that it ends with more introspection, with wallowing, seemingly without any desire to work towards any change. Does Jasmine Donahaye join Jewish Voice for Peace? Does she share the work of Breaking the Silence? Does she take any interest in the present and the future? (In the postscript she talks about "another war between Israel and Hamas", which suggests not: it's the Israeli government's narrative that it is fighting "Hamas". It uses the phrase "Hamas" the way the author's racist aunt uses the word "Arabs". Israel does not fight Hamas, it fights Palestinians. As even-handed as her take on the past is, the book doesn't suggest she takes any strong interest in the present.) The book makes it seem as if all she really got for her research were mixed feelings about the past, rather than any drive to try and fix the broken land of Israel and Palestine, and that is heartbreaking. What good is shame, if one does not take any action as a result? And, to be honest, I'd hoped for a more accessible text, too. The book, written for a Welsh audience, uses the Welsh word hiraeth a few times - as a non-Welsh person, I know it's a unique word in the Welsh language, without a direct English equivalent. This, I guess, limits who the book it is written for. It's written for the Welsh literati. It's not written for Israelis or Palestinians. It's not written for Joe Public in the UK or America, or for politicians and leaders. I had hoped this book would be great to make people think, perhaps re-evaluate and change their minds, but, with its niche audience, I fear that it will struggle to get enough readers to make much of a difference. There is a lot to like about the way the book handles history, but I, personally, did not like the way the book sees the present or the future. History is there to be learnt from, not to be discovered and filed away.